Shopping for Historical Figures Plush? Pablo Picasso once said, "Every child is an artist. The problem is how to remain an artist once we grow up." 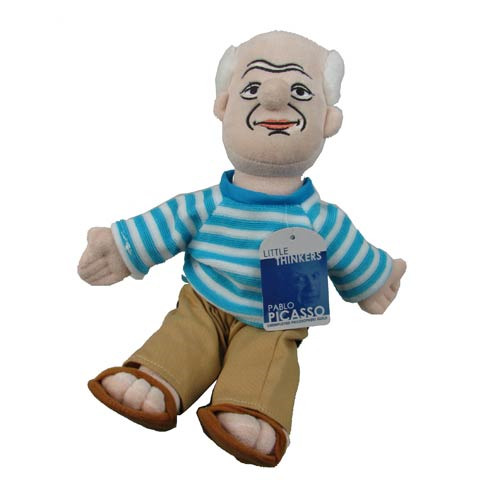 Well, one way to keep your inner child around is to play with cool toys like this Pablo Picasso Little Thinker Plush. The doll stands approximately 12-inches tall in Picasso's famous striped shirt, pants, and sandals. It bears a wonderful resemblance to the great man, and you can almost imagine him coming alive, scribbling something on a napkin, and selling it for millions of dollars! Ages 14 and up.